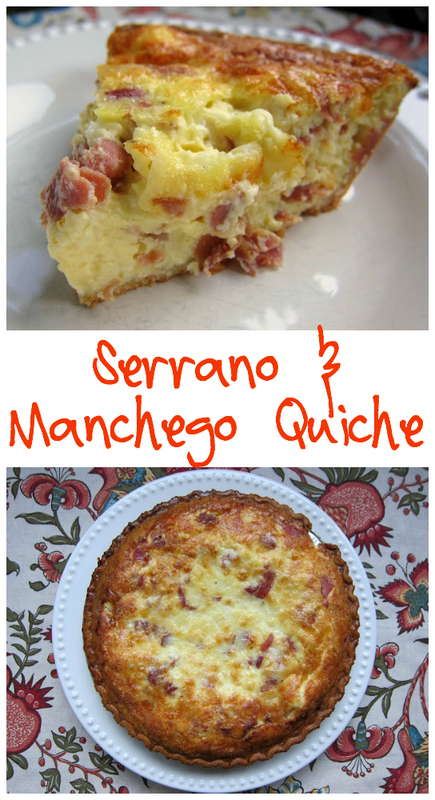 Serrano & Manchego Quiche Recipe - delicious quiche filled with serrano ham and manchego cheese (Spanish ham and cheese) - great flavors. Perfect for breakfast, lunch or dinner. Can make ahead and freeze unbaked. 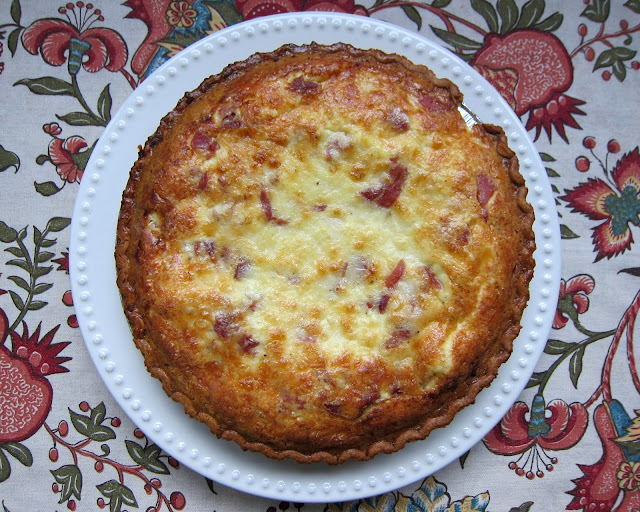 I first discovered the flavors in this quiche when I went to cooking school last year. The chefs grilled a piece of Manchego cheese wrapped in serrano ham and it was fabulous! They served it on a salad with homemade buttermilk ranch dressing (recipe here). I have been incorporating serrano ham and manchego cheese into our meals. We've made some quick paninis, and I made some Serrano and Manchego Pinwheels earlier this year. Chicken Legs requested a quiche for breakfast last weekend. I had some serrano ham in the freezer and decided to use it for the quiche. This quiche is not diet food by any means. It has 8 eggs and 1 1/2 cups of heavy cream. (Oh my!) That being said, the quiche was fabulous. It was super creamy and delicious! I found the serrano ham at Sam's. I have also seen it at World Market. Manchego cheese is in the deli area at the grocery store. Give this quiche a try if you are looking for an international flare to your next breakfast (or dinner). Place ham and cheese in bottom of deep dish pie crust. Whisk together eggs, heavy cream, salt and pepper. Pour egg mixture over ham and cheese. (You may have a little leftover). I am going to try this,without the crust. Bring on the eggs and cream for my Lo Carb lifestyle!! BTW I Love your page!! You give me wonderful ideas for the way I eat! Thanks and keep them coming!! Manchego became my favorite cheese 2 years ago when we sampled a local farms La Mancha cheese (Manchego cheese made outside of the designated region in Spain). It was "OMG" good. Then the farmers retired and sold their livestock so that cheese is no longer available. So sad, because most manchego we have tried has not been as briny and firm. Love the idea of pairing it with serrano, thanks for sharing that, Steph! I looked up your homemade ranch dressing and would love to make it but need to break it down for say 4 people. Can you help at all?